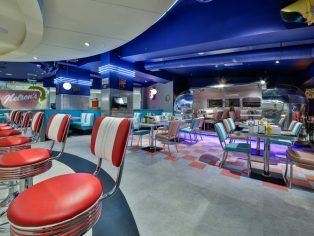 A variety of commercial vinyl tile products from UK manufacturer Polyflor were recently chosen to create a retro inspired interior design scheme for Nelson’s Diner in Newbury, Berkshire. 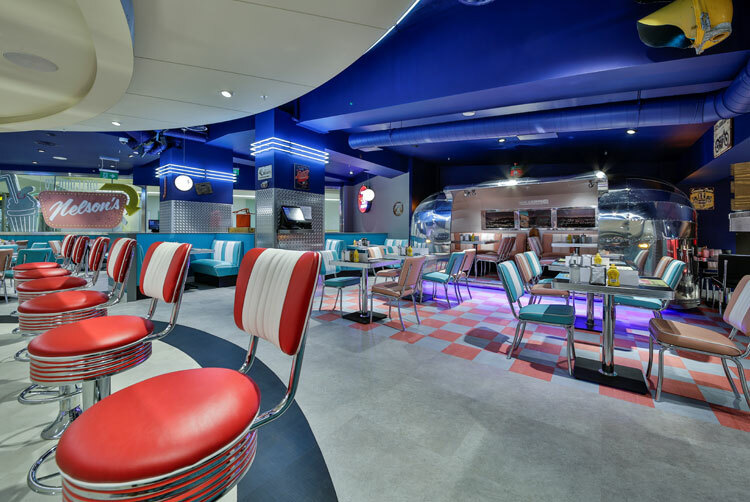 Approximately 300m² of Polyflor flooring was installed by The Hull Flooring Company Limited at Nelson’s Diner which offers American style cuisine in Kennet Shopping Centre. The refurbishment project was led by BMS Limited. Both the Expona Commercial and Expona Bevel Line luxury vinyl tile collections feature wood, stone and abstract effects which are ideal for heavy commercial environments in hospitality, retail and leisure sectors where there is likely to be a high level of foot traffic. Both these ranges feature a robust polyurethane reinforcement (PUR) which is cross linked and UV cured to provide superior cleaning benefits and a simple maintenance regime. Available in 25 colours, Polyflex Plus PU is a general-purpose homogeneous vinyl tile combining excellent performance with durability, ease of maintenance and endless design possibilities. Samples of Expona Commercial, Expona Bevel Line and Polyflex Plus can be ordered free of charge on the Polyflor website or by calling the Polyflor Samples Direct Hotline on 0161 767 2551. These products are also 100 per cent recyclable via the Recofloor vinyl take back scheme.